Submarines of this type served in the German (UB-1 class), Austro-Hungarian (U-10 class) and Bulgarian navies. Preceded by the UA and succeeded by the UB II class (SM UB-18-47). 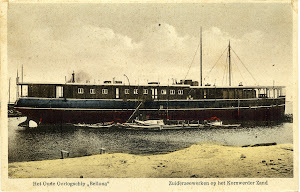 Building ordered on 25 November 1914, laid down by AG Weser, Bremen, Germany with yard number 225 on 21 February 1915, launched on 21 April 1915, commissioned on 4 May 1915 and lost after 11 March 1918 when she departed Zeebrugge, Belgium for a patrol. Her wrecked was found back in July 2013. General technical class characteristics. Displacement 127 (surfaced)-142 (submerged) tons and as dimensions 23,62 (pressure hull)-27,88/28,10 (over all) x 3,15 x 7,30 (depth) x 3,03 (draught) metres or 77.6-91.6/92.2 x 10.4 x 23.11 x 9.11 feet.. The machinery consisted of 1 diesel engine and 1 electric motor driving one screw allowing a speed of 6,47 (surfaced)-5.5 (submerged) knots and a surfaced range of 1.860 nautical miles with a speed of 5 knots and submerged 45 nautical miles with 4,5 knots. Test depth 50 metres/160 feet and able to dive within 33 seconds. Their crew numbered 14 men. The armament consisted of 2-45cm/17.7” torpedo tubes in the bow for which 2 torpedoes were carried and 1-0,8cm/0.31” machinegun.